Time again for an update from Xtrem Frelance|Xtreme blogs System. I am sorry that I could not add more content this month but w have been really really busy. You sure noticed our new look and the new testimonials. we have however did a few more blogs that we had no chance to present. Some of them will be presented soon, some will not as our new policy is to ad only the gold offer clients. If you wanna take a look to some of them, visit TheNetworkTraffic.com and InternetMarketingTipsBlog.com. With the advent of the Butterfly script, many marketers took the opportunity to use it for new websites. we have built 2 using it and I have to say it’s a pretty impressive piece of code. We cannot present them for now due to NDA but I hope we will do it at a later time. We have added a few new bonuses to the gold offer , including one related ot the other half from our title, Traffic Xcess, but more on this later. The other big addition to the offer is the 25 credits that you can use at Submitter bot to further promote your new blog in web directories, social bookmarking sites and to submit your articles to article directories. We saved the best for the last. One of our favorite clients, Royce Mills is starting a new online venture, Traffic Xcess. This is the same system, maybe even better, with the one used at traffic Python and List control among other viral traffic generators. If you know them, then you know it works pretty well. If not, now it’s the best time to jump into one. Royce offered me a JV membership and i can also offer a lot of credits (5000) to those signing from my link. Just click on the traffic Xcess banners on this page and you’re in, send me your user name to be credited. We have also offering a blog fo his contest, you can find all the details on his site. You can also benefit from his offer when you order our Gold package, we are offering a platinum upgrade(max!) 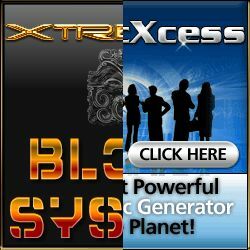 to all those that order along wth 100.000 credits so you can start using the system right away and promote your new blog.! Once again, go and check our Gold Offer to order and benefit from the best bonuses we had so far! If you’re not ready yet, click on the banner to join Royce’s Traffic Xcess and upgrade if you wish(you can make some nice commissions) or just use the credits to promote your businesses.